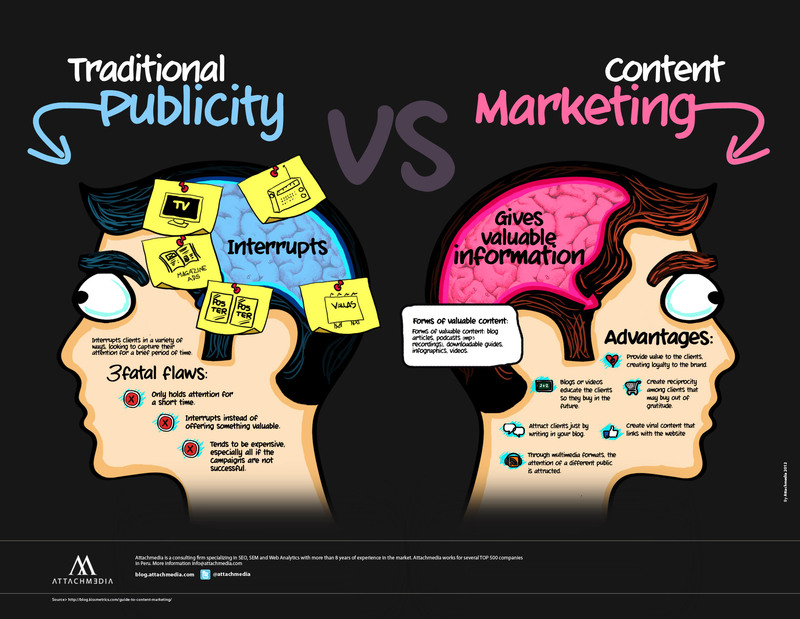 Marketing guru Seth Godin once said, “Content marketing is the only marketing left,” and at 451 Marketing, we agree with him. Content marketing – creating and delivering valuable content to your target audience – generates three times more leads than traditional marketing. It’s also incredibly valuable in building trust and creating value among skeptics – people who want to know what you know, but not necessarily what you sell just yet. It decreases costs all while increasing customers, all while remaining a scalable, repeatable process. Content marketing allows you to position yourself as an expert on particular subject area and develop your brand voice and personality. In doing so, you’ll attract new customers and maintain a dialogue with existing and past clients that will keep your brand at the forefront of their minds. It also allows you to increase social signals. Content marketing can be pursued through a number of different formats: whitepapers, e-books, case studies, blog and social posts, images and infographics, audio or video content, events and event content, and email newsletters, to name a few. It doesn’t directly convert non-customers, or sell a product, but it establishes a relationship that will act as a pipeline to doing so. To begin with, pinpoint your target audience – your ideal customers. Think about the groups you most want to attract: moms, millennials and CIOs are groups whose buying power and influence cannot be understated. Tackle your content marketing strategy by addressing your customers’ pain points: a need, problem, desire, or challenge they face. You can do so by analyzing common search inquiries around your product or industry using Google Search Trends and the Google Keyword Tool, as well as by asking your sales people what customers are predominately asking them. Research is key. Different platforms require different types of content creation. For examples, people in urban areas are more likely to be on Twitter than rural residents. Women are five times more likely than men to use Pinterest. Baby boomers are the fastest growing segment of Facebook. Use trends like these to shape future and categorize existing content. Organize content by type, date, topic, and persona, and repurpose content that is outdated but still has value. Fill holes in any missing content. It’s crucial to incorporate social and search goals. Start by defining major topics: think about what you know, fill in content gaps from your audit, and begin to stress achieving search and social goals. Designate an overall content coordinator, and have one from each functional areas. Members of the senior management team can oversee and contribute to add to the validity and value of your overall output. Creating a content calendar is key to staying on-task – Google Calendar is an excellent tool to share internally. While creating content, the most important question to ask is whether it inspires sharing. Is it unique? Fun? Credible? Inspirational? Beneficial? The best content checks all the above off the list. Certain types of content are more universally shareable : “How-to” stories, real-time marketing, “Top 10,” “Best of,” and countdowns, for instance. Make sharing simple by linking to social properties on your website, and include share buttons with the content that show the reader how many times this particular page has been shared. In order to keep on top of what content is trending, set up Google alerts and streams in Hootsuite. Keep on top of these measurements, and adjust when necessary. By being generous, valuing consistency, and becoming an authority on select subjects, you’ll build invaluable trust with your readers. It’s no secret that the best part of beginning another year is the sense of newness in the air. It’s the chance to do something fresh, whether that’s to set a brand new goal or to simply approach the same goal(s) in a new way. This isn’t a feeling that only affects individuals; many organizations and industries are interested in pursuing the same new feeling, and PR is no different. Echoing a sentiment seen in many PR-centric outlets, PR Newswire predicts that digital media and social media will continue to influence the PR industry: not only will consumers continue to connect with their favorite businesses through social media outlets, but also social networks themselves will continue to find ways to successfully work with one another – or not. This was seen late last year when Twitter prohibited Instagram photos from appearing directly on its website. As a result, PR tactics will involve more collaboration within multiple departments, will be strongly content-based, and will increasingly use visuals (i.e. images, infographics, videos) for differentiation. These multiple platforms will also be further integrated into ROI measurement reporting as well. However, these emerging changes and expectations point to another trend PR Newswire and others may not have considered: an increase in crisis management. As PR departments continue to develop content that increases a brand’s visibility, they also increase the represented brand’s own transparency and accountability—also known as their Corporate Social Responsibility (CSR) initiative. Although Forbes’ blog pointed out a concern that CSR has “stalled” in the past, with the changes occurring in today’s society, consumers and organizations are continuing to make businesses more responsible for their actions. This is becoming especially more prevalent as target markets become more fragmented and the digital sphere continues to grow. While this train of thought may put a dark cloud in the sunny skies of the new year, a brand’s corporate responsibility is something consumers continue to bring into question—especially when they feel like their favorite business, brand, or celebrity violates that responsibility. Singer Beyoncé Knowles recently came under fire from the Center for Science in Public Interest (CSPI) for signing a $50 million contract with Pepsi Co. as a “brand ambassador.” The organization cited her partnership with the brand as a negative influence on the health of Americans, many of whom fit the demographics of Knowles’ own fan base. Similarly, Swedish clothing company H&M has also recently been called to end its partnership with South Korea-based Daewoo International, stating that Daewoo’s product comes from Uzbekistan which uses forced labor. H&M’s use of the cotton contradicts its pledge to oppose forced child labor in the country. These instances have not been without continued backlash: Knowles’ decision raises questions about her business ethics and influence amongst her younger fans; a petition against H&M’s partnership with Daewoo has emerged online. This isn’t to say that every PR department in 2013 will suddenly find itself working overtime to handle a possible crisis. However it is still important that PR departments and firms alike still make sure they account for CSR in their strategies. Additionally, a strong crisis management plan should also be a required part of all brands’ 2013 planning. Customers’ expectations of their favorite brands are as high as ever, and brand loyalty sometimes does not always trump personal morals. What do think of the trends in PR you see emerging in 2013? Are there any trends that you think PR Newswire forgot? Let us know in the comment section!